Perhaps we should have been a little critical of Google’s directions when we stopped the car in front of a small but swiftly moving stream in our path. I got out to survey the situation. Could our rental car make it? I scouted around for a better crossing. If we drove over to the left a bit and down the embankment, the water was definitely shallower. But was this really the way to the famous Fourteen Colors Mountain (Cerro de Catorce Colores)? 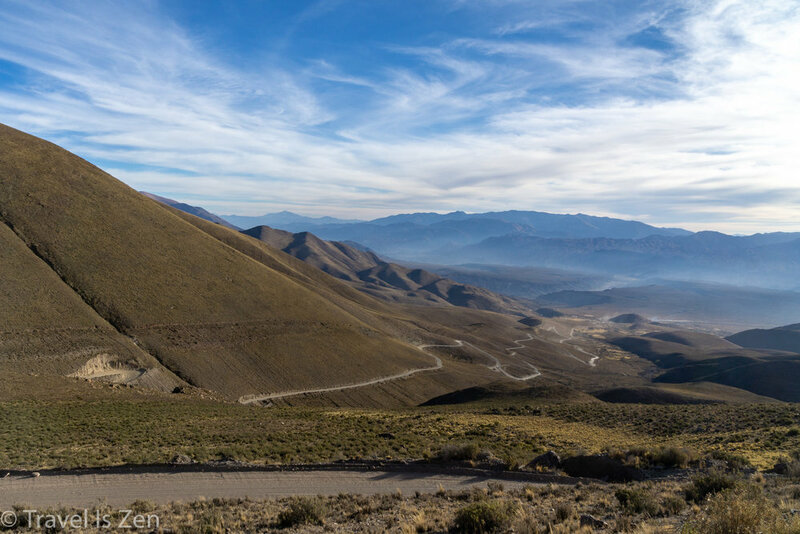 I had a hard time believing that this dusty desert road was the main route traversed by tour buses and car pools of vacationing families headed to the premier tourist spot in Jujuy Province. We double-checked Google Maps, operating in offline mode because there was no cell service. Yep, we were just outside the sleepy town of Humahuaca, on the Quebrada de Humahuaca, an ancient Incan caravan road. Our little rental kicked up pebbles and a spray of water, but we made it across. The road was rocky and uneven; speeds above 20 miles an hour shook the car, so we took our time and enjoyed the desert landscape. My mom and aunt had joined us in Buenos Aires for a tour of Argentina. 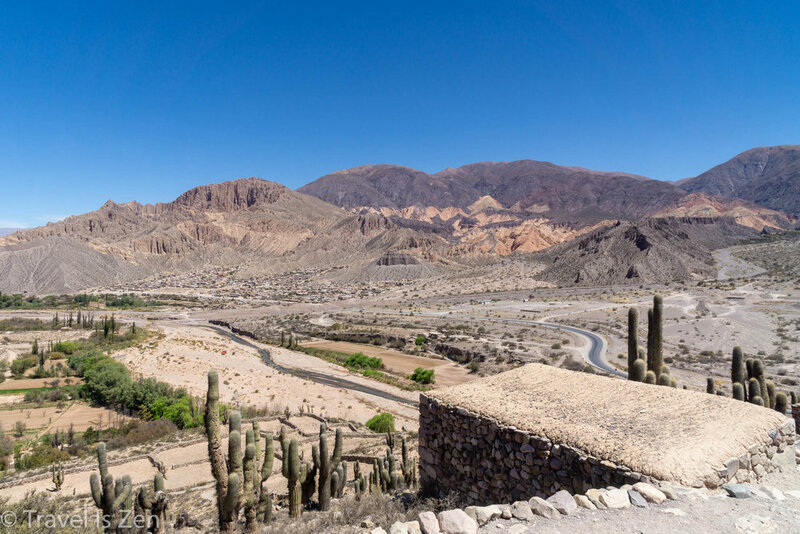 They survived the 24-hour bus trip to Salta, the winding mountain pass to Jujuy and were now oooh’ing and aaah’ing over the ancient, weathered cacti. We were road-tripping through northwest Argentina’s colorful Rainbow Valley, stopping earlier in the day at Tilcara for our first glimpse of the region’s striking, multi-hued geological formations. We also visited the remains of a pre-Incan fort town preserved by archaeologists and sampled llama meat at lunch. I was pleasantly surprised that it was tender and lean! The ladies were a bit trepidatious, driving on unfamiliar roads into rural territory in a foreign country with no other cars in sight and no cell phone service. We reassured them that it was fine. We were visiting in the off-season, so there probably weren’t many other tourists. No worries. In fact, about half an hour into the drive, we had a far-off sighting of Cerro de Catorce Colores to the east, its vibrant multi-hued peak contrasting against the smaller brown foothills of the Serrania de Hornocal mountain range. Surely we would be making a right hand turn any minute, heading towards those colors. An hour went by and we were still heading north. I was starting to squirm. The brief glimpse of the mountain had receded. We could no longer see our landmark. We kept driving, passing nothing but the occasional sleepy dog and isolated farms with meager crops behind hand-stacked stone walls. The road was getting rougher, rockier, lonelier. My mom and aunt were quiet, sharing looks in the back seat. “We’re fine,” I said, with less assurance than earlier. Google directions suggested a left turn. “What? We need to be heading right…like an hour ago.” Caffrey spent a few minutes with the downloaded offline map and surmised that we had pinned the wrong location in Google. When we did our Google search of Jujuy Province, search results showed Quebrada de Humahuaca with a photo of Cerro de Catorce Colores. 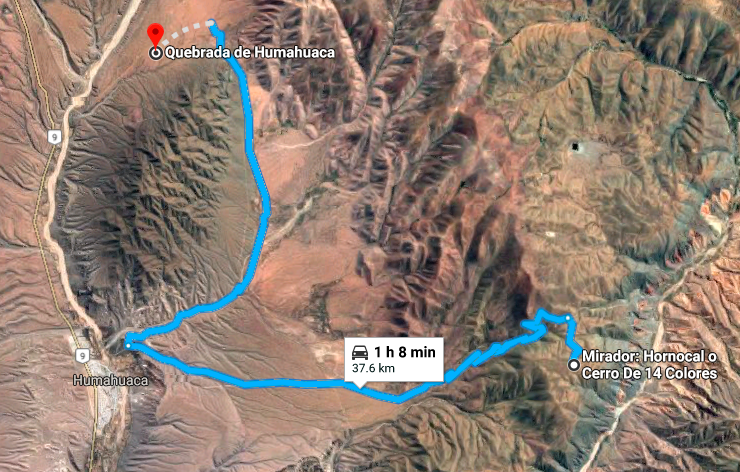 We pinned Quebrada de Humahuaca in Google Maps. We should have pinned “Mirador Hornocal o Cerro De 14 Colores”. The mirador (viewing location) was 25 miles to the east. The sun was beginning to dip, giving us less than two hours to course correct before sunset. Caffrey found a local shortcut to Route 73; it was even rockier, narrower, and lonelier than the previous. The undercarriage rattled and the dashboard vibrated as we pushed the tolerance of our rental car on this desolate backroad. There it was! Cerro de Catorce Colores at 14,000+ feet. The late afternoon light was perfect. We tumbled out of the cramped car, stretched, breathed in the cool, thin air. And then we relished the view we had sought all day, sharing the scene and gentle breeze with just a handful of other late arrivals. The drive back to Humahuaca took just 45 minutes under a blazing sky that faded to black as we crossed the bridge over the Rio Grande. We had taken the road less traveled to Cerro de Catorce Colores, but that made all the difference. What could have been just an ordinary road trip was, instead, an adventure. Do you have a crazy story off the beaten path? Share in our comments or tag @traveliszen in your photos on social media.